“The funnel of the sky stretches up to the heavens, an ominous tower of storms with only a tiny glimmer of hope lighting the eye of turmoil high above. “Come to me, come with me,” the voice of a stormcrow whispers to him from nearby. “Let me guide you through.” With anxious eyes, he gazes upwards, away, oblivious to the proffered guidance through the dark night of the soul. He clutches a sheathed sword close for security, though he could easily grasp its bright blade aloft to light the way. But he is ignorant of that beacon he holds so tight, or perhaps too weak hearted and tremulous to wield it. He suffers from anguish. The swords tattooed upon his breast are pinpricked markings of the regrets he experiences. He is tormented by inner fear, anxiety, guilt, and uncertainties in the night. He is a being of the air – his wings should carry him aloft, and the sky should be open and expansive and a world of freedom. Instead, it feels like a trap closing its jaws upon him with the howling winds of the approaching storm. And yet, if he were to just cast aside those doubts, he could be as free as the stormcrows that spiral in untroubled arcs above. This is a message about facing your fears, releasing yourself from feeling stuck by your circumstances, and daring to create something new. Fear is holding you hostage in more ways than you realize. Emotionally, physically, mentally and spiritually. Vibrationally. Look at it closely. Where is the fear coming from? Is it so ingrained that you are used to it? Are you feeling like a victim of circumstance in your own life? It’s time to create something new. Release the old scars, the regrets, the pain of the past. It is time to soar above the drama and the limited perceptions of what is possible for you. And the only way to do this is to take full responsibility for everything that has happened in your life and learn from it. See the lesson and let it all go. Focus your energy elsewhere, away from the old habits and ways of being in the world. The birds in this card represent freedom as they soar up towards the portal of light and infinite opportunity. 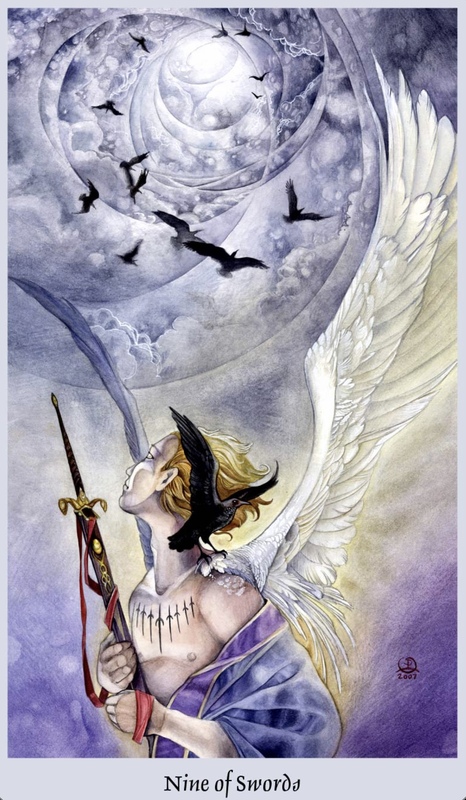 He is so aware of the pain of the past it is literally engraved on his chest; yet he fails to notice his own big, beautiful and powerful wings, where his guide stands trying to get his attention; to offer support. Yet he looks the other way. He thinks he needs a sword to fight his way through life, yet what he needs instead is to trust in his ability to rise above it all and create something new. Look at your own life. Where are you being held back by the past? Are you seeing the Light being offered to you now? Where can you shed the old pain and the weight of past regrets and mistakes and find renewed strength and courage to release all the old and embrace a new lightness of Being? Trust in yourself and your own big beautiful, powerful wings to take you where you need to be. For the Highest Good Of All.